I like to go to places that are unexpected places to go to for wine. As an Ontario girl, I have not yet visited BC wines but I was lucky enough to try a large number of them at an event put on by BC wines. Of course I’ll have to visit but I’ll likely go after Bulgaria and Romania so I wanted to encourage you to go now anyway because I think Canada is one of the world’s most under-rated wine regions. Wine is all about a sense of place, and we invite you to discover the people and place behind our wonderful industry. 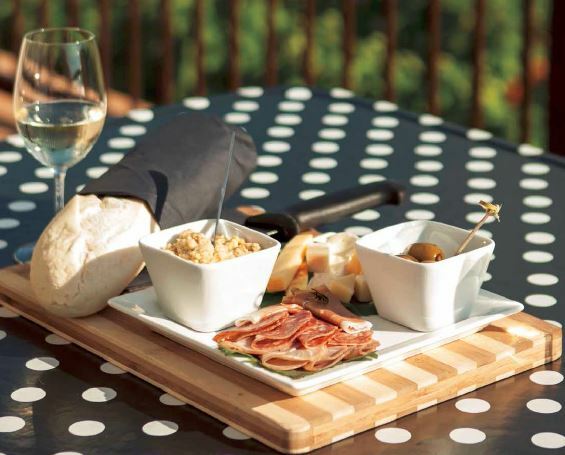 There is an undeniable romanticism to staying in wine country. Waking up and wandering through rows of grape vines. Lounging poolside with the glass of wine. Watching the sunset over the vineyards. This enchanting aspiration is not lost on British Columbia Wineries, which have a plethora of amazing accommodations available for those who wish to linger longer. From sleek and modern minimalist lofts, to cozy country cabins and Tuscan-inspired villas, there is a huge array of places to lay your head – each taking full advantage of breathtaking vineyard views. When it comes to pairing wine with seasonal, locally sourced cuisine, BC chefs who have been drawn here for access to fresh ingredients are creating exciting pairings that can’t be missed. Try BC wine on menus from Vancouver and all over wine country paired with international cuisine – from Indian to Thai and from Italian to Ethiopian as well as a our own distinctly Pacific Northwest style. In BC Wine Country, internationally acclaimed restaurants are putting out cuisine to be celebrated. Old Vines Restaurant at Quails’ Gate Winery, The Terrace at Mission Hill Estate Winery and Miradoro Restaurant at Tinhorn Creek Vineyards have all recently been named among the top winery restaurants in the world by highly respected publications. The BC winery restaurant scene is so hot, that new chefs are moving to wine country from all over the world to be a part of this flourishing industry. Once you have decided which region to visit, it then comes to determining the best way to enjoy wine country. The handy trip planner tool on WineBC.com provides an excellent resource for anyone looking to tour. Carpooling with a group of friends is a great way to tour, but for those who want to sit back and relax, there are several guided tours available for any style of traveler. Whether you’re looking to tour by land, air, or water, BC’s wine regions offer it all. For a relaxed trip, perhaps you’d enjoy a guided trip by limousine, vintage car or bike. Feeling a bit more adventurous? You can take to the skies with a float plane or helicopter wine tour. For something extra special and unique in the Okanagan, try a kayak or stand up paddle board (SUP) wine tour. For more than 30 years, destination wine events have drawn people from around the world to the Okanagan, Vancouver and Gulf Islands, Fraser Valley and more. From ocean shores to mountain tops, and during every single season there is a wine event to be found. Long table dinners in vineyards, private vertical tastings and wine parties that won’t soon be forgotten are just some of the choices. Go to WineBC.com for the most up-to-date list of events. Want to discover the best local wine-and-food scene? Take some time to enjoy one of the local farmers markets during your stay and celebrate farm-fresh ingredients. Not only can you get a vast array of fresh produce, baked goods and artisanal ingredients, but you can now sample and buy your favourite BC VQA wines from local wineries. In its first year of implementation, markets across BC reported increased traffic, which they naturally attribute to the sale of wine, beer and spirits. British Columbia is a very special place for wine and, thanks to a handful of hard-working visionaries, our vibrant industry has been making a name for itself nationally and internationally for the past 25 years. In 1990, the Vintner’s Quality Alliance (VQA) standard was created to guarantee consumers they were drinking wine made from 100% BC grown grapes. 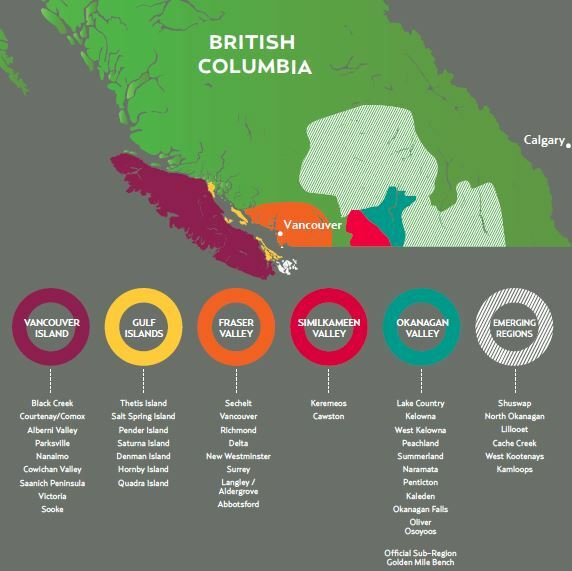 Today, BC VQA wines dominate wine sales in British Columbia, and our wines are finding their way to more places than ever before, winning over both critics and consumers internationally. The Wines of British Columbia truly are a reflection of the land where the grapes are grown and the exceptional people who craft them. We invite you to join us to celebrate 25 years of excellence and savour all that makes the Wines of British Columbia so special. BC’s wine industry has grown from just 17 grape wineries in 1990 to over 248 today (as of March 2015). • There are over 10,200 acres (4,130 hectares) of vines in British Columbia’s five geographical indicators (GI) more commonly referred to as designated viticultural areas (DVA) (Okanagan Valley, Similkameen Valley, Fraser Valley, Vancouver Island and Gulf Islands) and beyond. • Warmer and more arid than Napa Valley, the Okanagan Valley gets nearly two hours more sunlight per day than Napa during the peak of the July and August growing season. YES, CANADA MAKES WINE. GREAT WINE! 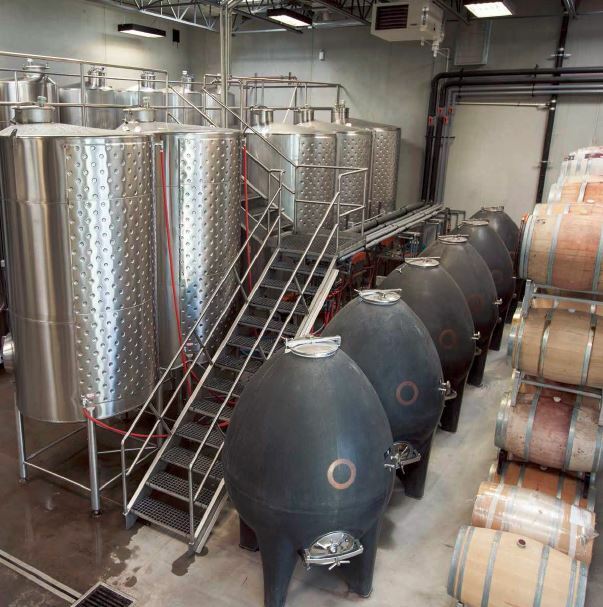 Internationally, it surprises many people that British Columbia even produces wine. Being so far north, above 49° latitude, the logical thought is that it must be too cold. Even those who accept that wine is made here expect it to be a marginal cool climate region, but British Columbia is like no other place on earth when it comes to growing grapes. BC has the unique combination of extreme heat and cold that results in intense fruit-driven, fresh and structured wines. With the vineyards north of 49° latitude, you would expect a very cool climate similar to other wine producing areas at this latitude, like the Champagne region of France and much of Germany that are indeed very chilly places to grow grapes. The Okanagan and Similkameen Valleys, where most of British Columbia’s grapes are grown, belie their location and instead of being cool have a unique climate best described as a short, hotgrowing season with desert-like conditions. While grapes are grown in many parts of southern British Columbia, 90% of all vineyards are in the Okanagan and Similkameen Valleys, a four-hour drive east from Vancouver. Between Vancouver and wine country is the Coastal Mountain Range. These impressive mountains strip the moisture from the weather that comes from the Pacific Ocean and, while Vancouver is a damp city, the Okanagan and Similkameen enjoy dry, desert-like conditions. Annual precipitation (combined rainfall and snow) levels range between 318 mm (12 inches) in Osoyoos on the USA border and 415 mm (16 inches) in Kelowna, 100 km (62 miles) to the north. The dry desert region of the south Okanagan Valley is the northern point of the network of deserts that stretch right through the USA and into Mexico. Low rainfall and lots of sunshine make it easy to farm sustainably and help produce pure, intensely fruit-driven wines. The folklore of Icewine suggests that its first production in 18th century Germany was a happy accident. A German vineyard owner away on business at the end of harvest came home to a frozen vineyard. He harvested and processed the grapes anyway, and what was then called Winter Wine was born. In Canada, Hainle Vineyards Estate Winery in Peachland produced the country’s first Icewine in 1978. Canada is now recognized as the world leader in Icewine production. Icewine is produced by many British Columbia wineries, but the only wine regions of BC where the winters are cold enough to provide the necessary conditions for Icewine are the Okanagan Valley and Similkameen Valley. 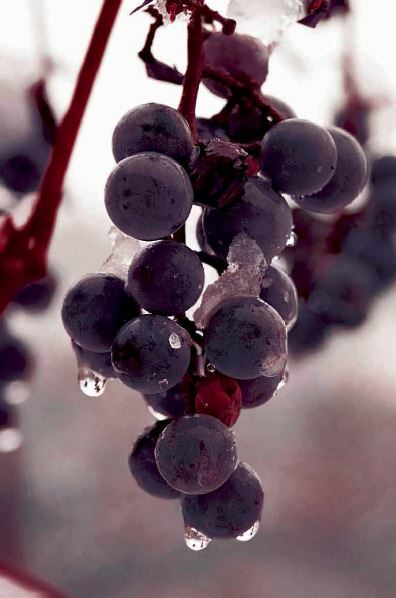 Even there, the conditions for harvesting and pressing Icewine grapes generally happen only several times per winter. 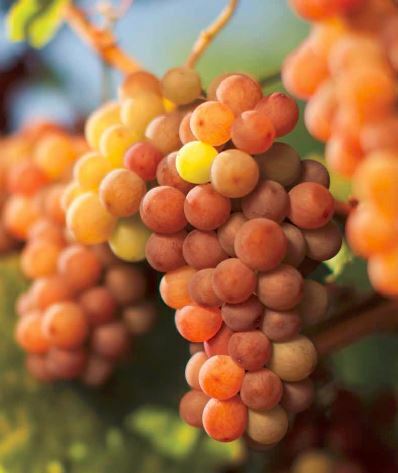 In a given year, anywhere from 15 to 25 wineries will leave grapes on the vine in anticipation of an Icewine harvest. Find your perfect getaway at WineBC.com. This sounds like an absolutely amazing place to visit. I enjoy wine and my husband and I have been considering a new destination. Perhaps January for the icewine harvest? Or do you think closer to the harvest? Canadian wines have never really been on my radar until I read your post so thanks for a very interesting piece! I shall have to keep my eyes open for some Canadian names next time I’m at the wine shop! Great pics too!